I loved this book and feel as if I've been on an epic journey. One of the best books I've read in a long, long time. I highly recommend. 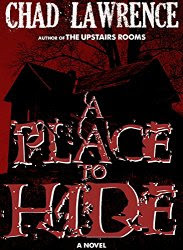 When teenage Denny drags his younger friend Scott for a look at the mysterious and remote abandoned mansion hidden behind a tall fence near their trailer homes, Scott thinks nothing of it, just another one of his friend’s many weird obsessions. It’s only after they take the new girl Sarah to see the mansion and the lock falls open in her hand, leading them to briefly explore the creepy place, when Scott realises the depth of Denny’s obsession with the strange house. Especially when Denny refuses to leave it, forcing Scott and Sarah to depart without him, much to Scott’s reluctance, although he figures Denny will surely come home when he’s done exploring the mansion. But then Denny fails to show up at school the next day. And when Scott does see his friend again later that night, Denny’s been changed somehow. His eyes are strange and black, and he’s wearing sunglasses to cover them, even in the dark. Plus he’s talking crazy about the old mansion, claiming that he now owns the creepy place by birthright and that he’s going to make it his home before he disappears again, only to reappear suddenly to help Scott defend himself from his older sister’s crazy boyfriend over a missing fifty-dollar bill, Denny beating the boyfriend badly while claiming to have been the one who had stolen the money in the first place, leading the local Sheriff to become involved in the search for Scott’s estranged friend, whom is now wanted for theft and assault. Then Denny returns to the neighbourhood the next night and attacks his own mother and takes his own younger sister back to the mansion with him and they both subsequently disappear,and the Sheriff becomes even more involved in the mystery, this time by dragging Scott back to the site of the abandoned mansion—a place where a terrible tragedy had occurred many years before—leading the confused teen to the most shocking discovery, and then starting him and his new friend Sarah on a dark quest to find their missing friend, no matter where it takes them, or when.